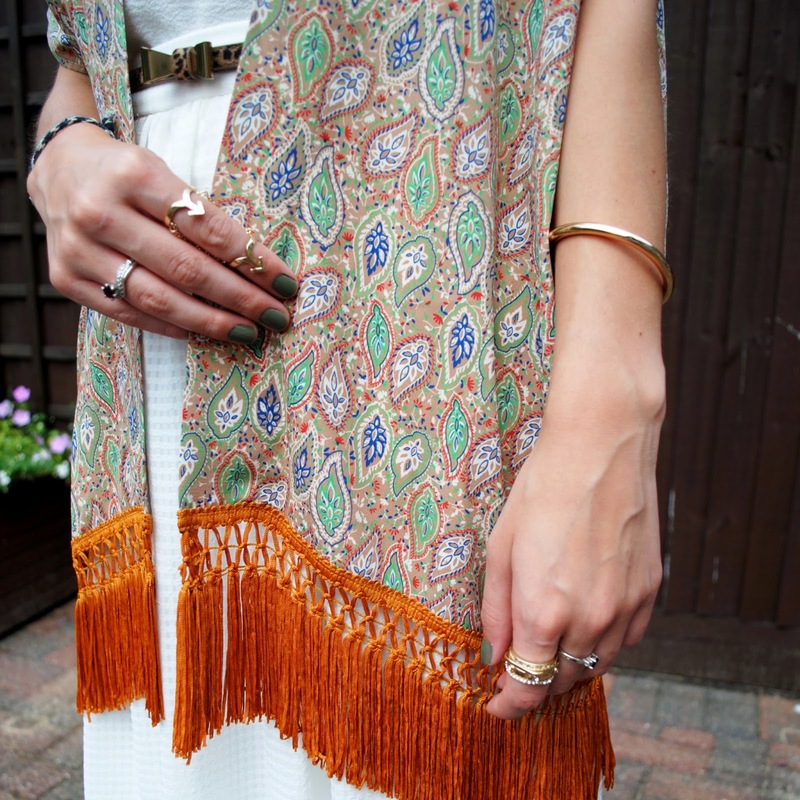 Following on from my last In Love with Fashion post I said I would be wearing one of their gorgeous kimonos. Although I loved their pastel and floral kimono/short co ords, I was drawn to this Paisley one. I don't know if it's maybe because I'm leaning away from pastels as we get closer to Autumn and everywhere is introducing their pre fall collections or if it's just because it was a little different. The colours are unusual and at first I kind of struggled to style it. I don't really have any rusty oranges or browns in my wardrobe and so I've styled it with pale green and blue vests. Here though I thought why not wear white... it goes with everything and it really made the colours stand out. 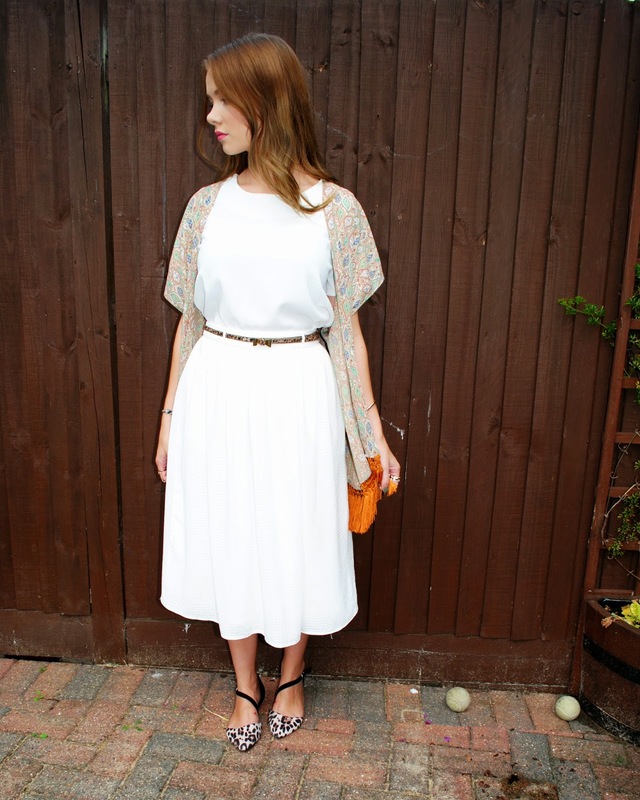 The kimono has a silky/viscose feel so is super soft and comfortable and perfect for this hot weather. I feel it'd be a great transitional piece going into Autumn/Winter too. The paisley print is made up of soft greens, blues and beiges with flecks of a bright orange which match the great tassel fringing. It's such a statement piece that I think it's best to keep everything else pretty simple so I wore a plain white textured t-shirt from Tesco's F+F range alongside my good old Primark midi skirt. This way I could mix up the textures without overcomplicating the patterns. I'm trying to be braver and pair unusual patterns together too so I teamed the look with a leopard print belt and shoes which had similar beige tones in. I was also sent some fab jewellery from JJDR House of Bijoux recently too and I thought the gold finish went well with the tones in the kimono. The bracelet is so different to any jewellery I own and is enough on it's own to jazz up an outfit. I think it would look great with a gold cuff. The two rings are both to be worn normally (not midi) and one is a stack of different styles and the other is a set of arrows connected by two chains. I love them both so go and check out JJDR House of Bijoux online as I'm sure you'll find some good'uns! I'd love to know what you'd style the kimono with?